↑ Klinger, D. H. et al. 2012. Moving beyond the fished or farmed dichotomy. Marine Policy. ↑ Global Aquaculture Production Fishery Statistical Collections, FAO, Rome. Retrieved 2 October 2011. ↑ Half Of Fish Consumed Globally Is Now Raised On Farms, Study Finds Science Daily, September 8, 2009. ↑ Aborigines may have farmed eels, built huts ABC Science News, 13 March 2003. ↑ Lake Condah Sustainability Project. Retrieved 18 February 2010. ↑ "History of Aquaculture". Food and Agriculture Organization, United Nations. สืบค้นเมื่อ August 23, 2009. ↑ McCann, Anna Marguerite (1979). "The Harbor and Fishery Remains at Cosa, Italy, by Anna Marguerite McCann". Journal of Field Archaeology. 6 (4): 391–411. doi:10.1179/009346979791489014. JSTOR 529424. ↑ Peter Neushul, Seaweed for War: California's World War I kelp industry, Technology and Culture 30 (July 1989), 561-583. ↑ Guns, Germs, and Steel. New York, New York: W.W. Norton & Company, Inc. 2005. ISBN 978-0-393-06131-4. ↑ "'FAO: 'Fish farming is the way forward. '(Big Picture)(Food and Agriculture Administration's 'State of Fisheries and Aquaculture' report)." The Ecologist 39.4 (2009): 8-9. Gale Expanded Academic ASAP. Web. 1 October 2009. <http://find.galegroup.com/gtx/start.do?prodId=EAIM.>. ↑ 21.0 21.1 "The Case for Fish and Oyster Farming," Carl Marziali, University of Southern California Trojan Family Magazine, May 17, 2009. ↑ "About Seafood Watch". Monterey Bay Aquarium. ↑ New, M. B.: Farming Freshwater Prawns; FAO Fisheries Technical Paper 428, 2002. ISSN 0429-9345. ↑ Data extracted from the FAO Fisheries Global Aquaculture Production Database for freshwater crustaceans. The most recent data sets are for 2003 and sometimes contain estimates. Retrieved June 28, 2005. ↑ Burkholder, J.M. and S.E. Shumway. 2011. Bivalve shellfish aquaculture and eutrophication. In, Shellfish Aquaculture and the Environment. Ed. S.E. Shumway. John Wiley & Sons. ↑ "Abalone Farming Information". Archived from the original on 13 November 2007. สืบค้นเมื่อ 2007-11-08. ↑ "Abalone Farming on a Boat". Wired. 25 January 2002. Archived from the original on 4 January 2007. สืบค้นเมื่อ 2007-01-27. ↑ World Wildlife Fund. "Sustainable Seafood, Farmed Seafood". สืบค้นเมื่อ May 30, 2013. ↑ Ess, Charlie. "Wild product's versatility could push price beyond $2 for Alaska dive fleet". National Fisherman. สืบค้นเมื่อ 2008-08-01. ↑ Eilperin, Juliet (2005-01-24). "Fish Farming's Bounty Isn't Without Barbs". The Washington Post. ↑ "Fisheries and aquaculture have good future". Herald Globe. สืบค้นเมื่อ 27 May 2014. ↑ "Output of Aquatic Products". China Statistics. สืบค้นเมื่อ 2011-04-23. ↑ Heilprin, John (2001) Chinese Misreporting Masks Dramatic Decline In Ocean Fish Catches Associated Press, 29 November 2001. ↑ China disputes claim it over reports fish catch Associated Press, 17 December 2002. ↑ FAO (2006) The State of World Fisheries and Aquaculture (SOPHIA), Page 5. ↑ 45.0 45.1 Chopin T. 2006. Integrated multi-trophic aquaculture. What it is, and why you should care ... and don't confuse it with polyculture. Northern Aquaculture, Vol. 12, No. 4, July/August 2006, pg. 4. ↑ 46.0 46.1 Neori A, Chopin T, Troell M, Buschmann AH, Kraemer GP, Halling C, Shpigel M and Yarish C. 2004. Integrated aquaculture: rationale, evolution and state of the art emphasizing seaweed biofiltration in modern mariculture. Aquaculture 231: 361-391. ↑ Braithwaite, RA; McEvoy, LA (2005). "Marine biofouling on fish farms and its remediation". Advances in marine biology. 47: 215–52. doi:10.1016/S0065-2881(04)47003-5. PMID 15596168. ↑ "Commercial and research fish farming and aquaculture netting and supplies". Sterlingnets.com. Archived from the original on 26 July 2010. สืบค้นเมื่อ 2010-06-16. ↑ "Aquaculture Netting by Industrial Netting". Industrialnetting.com. Archived from the original on 29 May 2010. สืบค้นเมื่อ 2010-06-16. ↑ Costa-Pierce, B.A., 2002, Ecological Aquaculture, Blackwell Science, Oxford, UK. ↑ FAO: World Review of Fisheries and Aquaculture 2008: Highlights of Special Studies Rome. 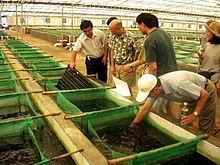 ↑ "Aquaculture's growth continuing: improved management techniques can reduce environmental effects of the practice.(UPDATE)." Resource: Engineering & Technology for a Sustainable World 16.5 (2009): 20-22. Gale Expanded Academic ASAP. Web. 1 October 2009. ↑ Nickerson, DJ (1999). "Trade-offs of mangrove area development in the Philippines". Ecol. Econ. 28 (2): 279–298. doi:10.1016/S0921-8009(98)00044-5. ↑ Gunawardena1, M; Rowan, JS (2005). "Economic Valuation of a Mangrove Ecosystem Threatened by Shrimp Aquaculture in Sri Lanka". Journal of Environmental Management. 36 (4): 535–550. doi:10.1007/s00267-003-0286-9. ↑ Meat and Fish AAAS Atlas of Population and Environment. Retrieved 4 January 2010. ↑ FAO: Cultured Aquatic Species Information Programme: Oncorhynchus kisutch (Walbaum, 1792) Rome. Retrieved 8 May 2009. ↑ Mcleod C, J Grice, H Campbell and T Herleth (2006) Super Salmon: The Industrialisation of Fish Farming and the Drive Towards GM Technologies in Salmon Production CSaFe, Discussion paper 5, University of Otago. ↑ Huntingford, F. A.; Adams, C.; Braithwaite, V. A.; Kadri, S.; Pottinger, T. G.; Sandoe, P.; Turnbull, J. F. (2006). "Current issues in fish welfare" (PDF). Journal of Fish Biology. 68 (2): 332–372. doi:10.1111/j.0022-1112.2006.001046.x. ↑ Baras E. And Jobling (2002). "Dynamics of intracohort cannibalism in cultured fish". Aquaculture Research. 33 (7): 461–479. doi:10.1046/j.1365-2109.2002.00732.x. ↑ Greaves K., Tuene S. (2001). "The form and context of aggressive behaviour in farmed Atlantic halibut (Hippoglossus hippoglossus L.)". Aquaculture. 193 (1–2): 139–147. doi:10.1016/S0044-8486(00)00476-2. ↑ Paperna I (1991). "Diseases caused by parasites in the aquaculture of warm water fish". Annual Review of Fish Diseases. 1: 155–194. doi:10.1016/0959-8030(91)90028-I. ↑ Eilperin, Juliet; Kaufman, Marc (2007-12-14). "Salmon Farming May Doom Wild Populations, Study Says". The Washington Post. ↑ OSTROUMOV S. A. (2005). "Some aspects of water filtering activity of filter-feeders". Hydrobiologia. 542: 400. doi:10.1007/s10750-004-1875-1. สืบค้นเมื่อ September 26, 2009. ↑ "Environmental impacts of shellfish aquaculture" (PDF). 2008. สืบค้นเมื่อ 2009-10-08. ↑ "Aquaculture: Issues and Opportunities for Sustainable Production and Trade". ITCSD. July 2006. ↑ "Pew Oceans Commission report on Aquaculture"
↑ 86.0 86.1 "Growing Premium Seafood-Inland!". USDA Agricultural Research Service. February 2009. ↑ 87.0 87.1 "Stabilizing Climate" in Lester R. Brown, Plan B 2.0 Rescuing a Planet Under Stress and a Civilization in Trouble (NY: W.W. Norton & Co., 2006), p. 199. หน้านี้แก้ไขล่าสุดเมื่อวันที่ 29 พฤศจิกายน 2561 เวลา 13:45 น.